Mount Bielawski, also known as Mount McPherson, is located on private property. 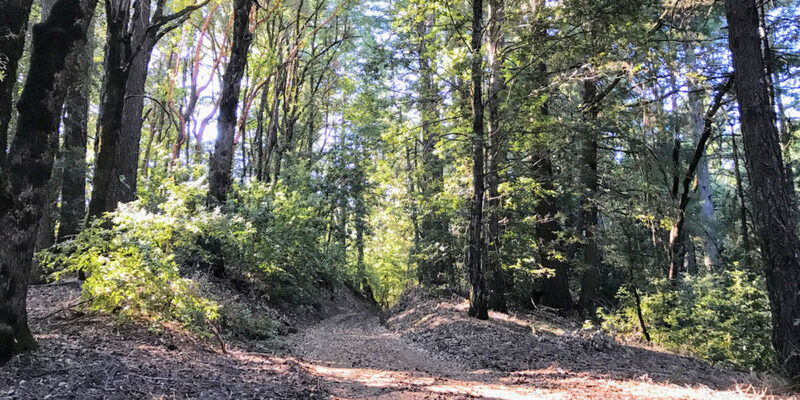 It’s probably possible to get permission to go to the summit proper, but for me it’s a good excuse to visit Castle Rock State Park—a beautiful park on the west side of the Santa Cruz mountains, and a very popular spot for rock climbers. I had looked at various ways I might activate this summit—including the possibility of just hanging out on the road right below it. In the end, I decided it would be most enjoyable to hike up the Castle Rock Trail—a short trail that starts at the entrance to the state park and loops around right by the park’s namesake peak, Castle Rock. Having looked at the contour map(s) for this area repeatedly, I decided that most of the ridge along the southeast little corner of the park was within the activation zone. I wasn’t going to be completely certain until I saw for myself. Having just finished activating Sierra Morena 20 miles north, I made it down to this spot a little bit before 0800. I was a little concerned the street parking (free) would already be full, since this is a very popular park for both climbers and hikers. However, when I arrived, there was still plenty of parking. Skyline Boulevard (or Highway 35) was severely damaged in several places during our extremely wet winter, and one of those failures managed to close it completely, just south of this summit. I think that helped, to some degree, with the amount of people visiting. The entrance is easy enough to find. Upon entering the park, you’ll easily find the trailhead, where there’s a big map of the park and descriptions of various hikes and their difficulties. Take a left where the trails start, and you’ll start going uphill immediately. After a short hike up the hill, you’ll come to a junction with a service road. I noted this as the place I’d most likely set up my operation, since my altimeter was showing I was now within the activation zone. Then I continued on a little bit higher, to see the various sandstone rock formations I knew to be up here. Having gotten to the top, and seeing a few people gathering to climb already, I decided to turn around and set up my operation at the trail/service road junction mentioned earlier. It was at about 3180ft elevation. There are lots of trees good for antenna wire slinging here, so I picked one just off the trail that had a nice horizontal branch up about 35 feet. On my first throw I missed by shooting too high and almost got my wire on a branch up about 45 feet. Kinda wished I had gotten that branch! With another try, I got the wire over the intended branch and set up with a sloper pointing roughly east. I set my radio on an old fallen tree and got to business. As with the activation earlier in the day, there was again the problem of mosquitoes. It took them a while to congregate, but once they did, it quickly became a much more severe issue than the previous activation. It was seriously difficult to concentrate at times. I had considered just trying CW on one of these activations to see if I could pull it off, but with the mosquito distraction, even speaking into the mic became a challenge at times. Finding clear frequencies seemed to be a challenge for both this activation and the earlier one—there were the usual strong stations on the air (and the broadcast ones on 40m), but also weak ones I’d hear after thinking I’d found a clear frequency. But I did manage. After waving my phone around as if to conjure a magic spell, I was able to spot myself and get going on 20 meters. I had a few great QSOs there, then moved to 40 meters and got another few there. I again had the VHF setup with the telescopic antenna, but didn’t get any contacts there after a few CQ calls. Next time I do activations in the woods like this and the earlier one, I’ll definitely be bringing my bug net!